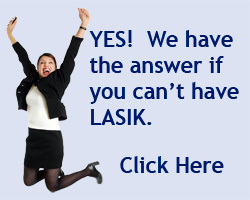 There are many ways to put drops into your eyes. No one likes to have the drop actually hit the eye ball. Probably the easiest way to do it yourself is to stand in front of a mirror and follow the diagram below. If you have someone to help you they can follow the same basic technique. 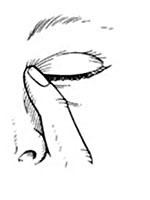 Stand in front of a mirror and pull down lower eyelid. This will form a "bowl" on the inside of the eyelid. 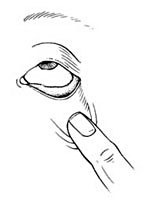 Place an eye drop into the bowl that was formed on the inside of eyelid. Then just let the eyelid go and the drop will spread around. 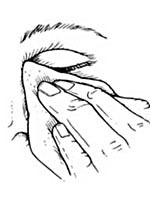 You can wipe away any excess and tears. You're all done!